When people from all over the world gather to talk about Spanakopita, their lively recipe advice pours forth generously. Our cooking group recently had a thread about this delicious and satisfying Greek dish which can be dressed up or down. Starting with a basic recipe of spinach, feta cheese, chopped sauteed onion, eggs, and feta cheese ensconced in puff pastry, we asked friends to offer the additions and alterations that make their family versions a hit. Puff pastry was offered in the original version. Many people use phyllo dough, regular dough, and one lovely lady suggested a relative newcomer: tortillas. After hearing this, one member said she had some spinach tortillas she was going to try. Just brush the bottom lightly with melted butter as though it was phyllo. At the mention of her yai ya, which is Greek for ‘grandmother,’ the entire group had an ‘aw’ moment. We love our yaiyas! 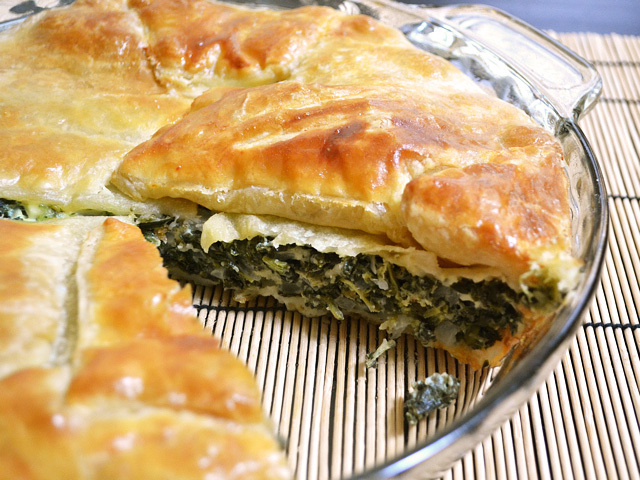 Spanakopita is a savory treat for our friends and family. While no extra herbs or cheeses are necessary, it's fun to switch it up. Saute the diced onion in the olive oil until soft and translucent. 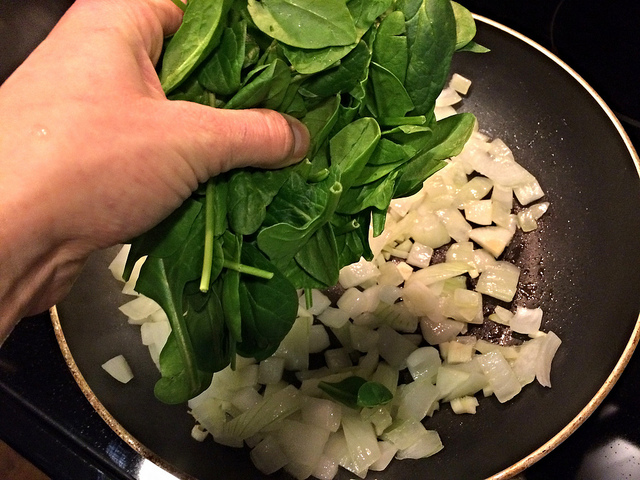 Add the spinach and cook until spinach is wilted and the water cooked off, 7-10 minutes. Set aside to cool. Roll out the thawed puff pastry into two pieces. One will be the bottom, and one will be the top of your spinach pie. Some people like to make a big square for the bottom and fold over the corners to make the top, as shown. When the spinach mixture is cooled until it is not hot enough to cook the eggs, add the beaten eggs and the feta cheese and mix well. Put the mixture into the lined pie dish, and then cover it with the other rolled out piece of puff pastry. Score the top lightly and brush with egg white. Bake at 350 degrees for 35 minutes or until top is golden brown. Allow the pie to rest before eating. As more and more people turn away from eating as much meat, Spanakopita really shines at gatherings and parties. Don’t be shy about experimenting with crusts, herbs and cheeses you think your family may enjoy. If you’re looking for a “one-stop Greek, Persian, Indian, Russian, Israeli, and Middle Eastern grocery store or restaurant in the Mesa area, please stop by and see us! Princess Mediterranean Restaurant & Market at 2620 W Broadway Rd in Mesa, AZ or call (480) 894-1499.